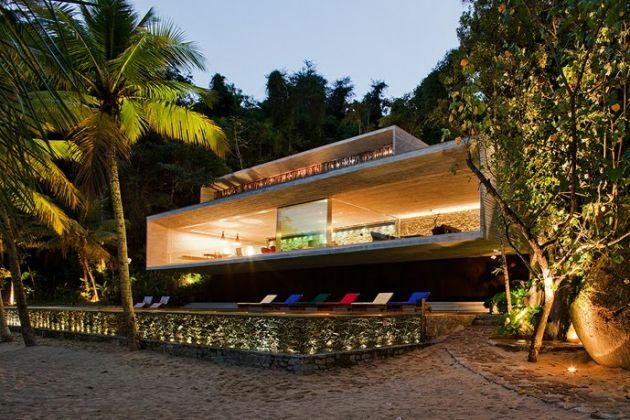 “Paraty House’s two reinforced concrete boxes, sit atop each other, connected on the mountainside of one of the islands of the colonial city of Paraty and Angra dos Reis (between São Paulo and Rio de Janeiro), like two modern prisms between the large colossal stones of the Brazilian coast. The residents arrive by boat. After stepping out onto the sand a metallic bridge positioned over a crystal-lined reflecting pool leads to a set of stairs connecting to the lower volume. This volume contains the living room, kitchen and service area. The continual internal area has a 27m span and huge glass windows to take advantage of the view of the sea. The same entrance stairs also lead to the upper volume that houses the bedrooms. In the front part of the house, retractile panels of eucalyptus sticks protect the bedrooms from the sun. The areas that face the mountain have small internal patios with zenithal lighting, and use exposed reinforced concrete, which grants a striking texture to the walls. The entire top of the house is covered with terraces, used as observation decks for the residents, and as a garden for sculptures, medicinal plants and edible herbs.” >> See more photos here.